Honeydew sorbet - Do You Know The Muffin Man? Notes: Didn't really measure any of the ingredients, just combined a honeydew with some syrup, lemon juice and vodka. 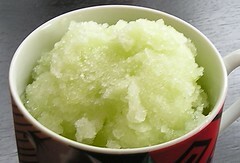 Slushy texture, quite sweet, with a nice melon taste.